Stor familj av konstnärer och tryckare verksamma i Augsburg. Johann Balthasar Probst 1504 - 1570. Georg Balthasar Probst 1673 - 1748. Johann Friedrich Probst 1719 - 1781. Jean Michel Probst 28/8 1721 - 1/8 1771. Georg Balthasar Probst 1732 - 1801. Johann Michael Probst d.y. 1757 - 1809. CANTELLI [da VIGNOLA] GIACOMO [JACOBO]. Mercurio Geografico 1688 (with maps). Pair of globes for the Duke of Modena. Utförde bl.a. 1689 en karta med titeln "General Landkort och Geographisk Afritning öfwer Westergiöthland, Dahl, Hallan och Bahuus Lähn, med der uthi liggiande Lähn, Härader, slott, städer, kÿrckior, herregårdar, prestegårdar, siöer, floder och elfver, landsväger, landemärc och härads skillnader... siergårder med des öiger, holmer, skier, hampner, och seglationer med annat som notabelt kunde giöras. Hvilket alt finnis på chartan... specificerat och med sine nampn noterat". 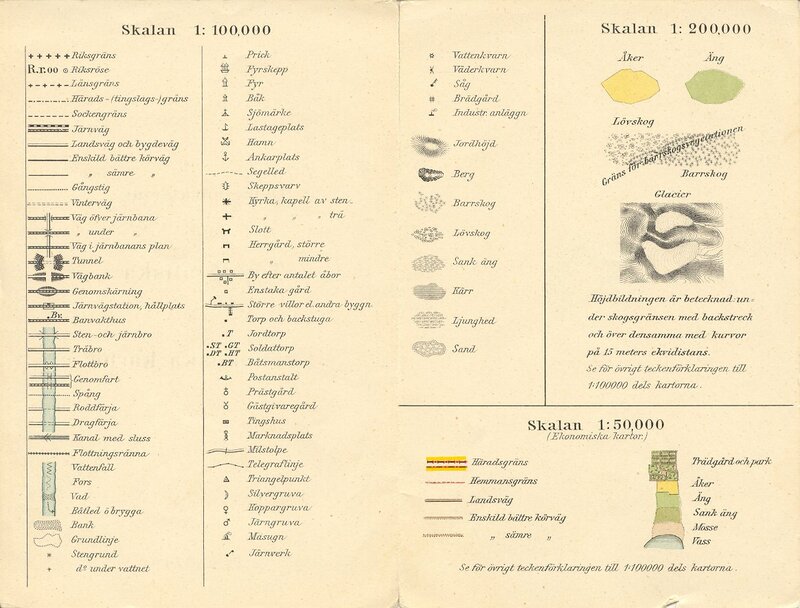 General Landkort och Geographisk Afritning öfwer Westergiöthland, Dahl, Hallan och Bahuus Lähn, med der uthi liggiande Lähn, Härader, slott, städer, kÿrckior, herregårdar, prestegårdar, siöer, floder och elfver, landsväger, landemärc och härads skillnader... siergårder med des öiger, holmer, skier, hampner, och seglationer med annat som notabelt kunde giöras. Hvilket alt finnis på chartan... specificerat och med sine nampn noterat. 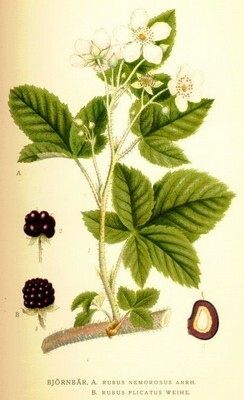 Björnbär, Rubus nemorosus - Lindman, C. A. M, Bilder ur Nordens Flora 1917-26. Marine map description of the northern countries and their wonders, carefully executed anno 1539. Olaus Magnus Gothus greets the honourable reader. To be able to understand easily this map of the Scandinavian countries and the wonders that exist there (I published this edition in honour of the revered Doge Pietro Lando and the senate of Venice and for the general benefit of the Christian world), you must know that it is divided into nine parts, indicated by the large letters A, B, C, etc, and further that there are several smaller letters within the area of each big letter, which indicate matters briefly referred to in the commentary. A comprises the island of Iceland, renowned for its unusual wonders; on this island, close to the small letter A ~ There are three mountains, their highest peaks glistening with eternal snow and their bases flaming with eternal fire. B ~ Four springs of very different nature: the first one by means of its eternal heat changes everything thrown into it into stone, while preserving the original shape, the second one is intolerably cold, the third on produces “beer”, the fourth one breathes forth destructive contagion. C ~ A fire consuming the water but not burning the wick. D ~ White ravens, falcons, magpies, bears, wolves and hares; yet there are also totally black wolves. E ~ The ice sounding like howling human voices and clearly indicating that human souls are being tormented there. F ~ A piece of rock that seems to fly through a great cloud of vapour. G ~ A vast number of fish heaped up for sale in a pile as high as the houses under the open sky. H ~ An incredible amount of butter. I ~ The pasture is so lush that unless the cattle are kept from grazing, they are destroyed through overfeeding. K ~ Sea monsters, huge as mountains, capsize the ships if they are not frightened away by the sounds of trumpets or by throwing empty barrels into the sea. L ~ Seamen who anchor on the backs of the monsters in belief that they are islands often expose themselves to mortal danger. M ~ Merchant ships attacking each other with canons in their fight to be first in harbour and do good trade. N ~ The arms of Norway and Iceland. B comprises first a part of Greenland, whose inhabitants, shown near letter A ~are pictured as very skilful sailors, using leather boats which are safe no matter what danger might threaten; using these they attack and sink the ships of the foreigners. B ~ Two colossal sea monsters, one with dreadful teeth, the other with horrible horns and burning gaze ~ the circumference of its eye is 16 to 20 feet. C ~ A whale rising up and sinking a big ship. D ~ A worm 200 feet long wrapping itself around a big ship and destroying it. E ~ Rosmarus, a sea elephant, sleeps hanging from the cliff and is caught thus. F ~ Several horrendous whirlpools in the sea. G ~ The insatiable and gluttonous wolverine emptying its stomach by squeezing itself between trees. H ~ A fisherman beating on the ice with a club so as to stun and catch the fish under it. I ~ Reindeers are tamed flockwise and surpass the swiftest horses when they are put before wagons. K ~ Demons, who have assumed bodily shape, are serving the people. L ~ A flock of domesticated reindeers giving milk for household use. * A find of gold. C shows, at letter A ~ forest people who attack the sailors by night but are nowhere to be found during the day. B ~ Pagan worshippers adore as a divinity a piece of red cloth attached to the top of a pole. C ~ Starchaterus, a Swedish fist-fighter, very famous in ancient time throughout all Europe. D ~ A magnetic island, 30 miles from the Pole, beyond which the sailor’s guide, the so-called compass, loses its power. E ~ A huge eagle wraps its eggs in the flayed skin of a hare; by means of its life-giving warmth the chicks hatched. F ~ The great white lake (the White Sea), where are to be found fishes and birds of an uncountable numbers of species. G ~ A marriage ceremony among the pagan worshippers performed with fire struck from flints held over the heads of the bridal pair. H ~ Exchange of necessities without the use of money. I ~ Battle between two kings, one of whom fights with reindeers and foot-soldiers on curved lengths of wood (that is, skis) and carrying bows. He defeats the other who fights on horseback. K ~ Reindeers draw a wagon (sledge) across the snow and ice. L ~ Sealhunting on ice-floes and an incredible abundance of salmon and pike. M ~ Marten, sable, ermine, different kinds of squirrels, everywhere an enormous number of beavers. N ~ Moscovite merchants dragging their boats between the lakes to do barter trade. D shows near the small A the island and the diocese of the Faroe Island, its fish-eating inhabitants cut up and divide among themselves the big sea animals thrown up by the storms. B ~ Here heads of ravens are given as a tribute to the governor of the region as a sign that they have killed the destructive bird which kills sheep and lambs. C ~ At the approach to this island there is a high rock, which the sailors call the Monk – an excellent protection against storms. D ~ The terrible sea-monster Ziphius devouring a seal. E ~ Another grisly monster, namn unknown, lurking at its side (that is to say at the side of Ziphius). F ~ Here lies the island of Tyle. G ~ The Hetlandic (Shetlandic) island and bishopric, a fertile country with the most beautiful women. H ~ The Orcadic (Orkney) island and bishopric, 33 in number, which in ancient times was called a kingdom. I ~ Ducks being hatched from the fruit of the trees. K ~ A sea monster similar to a pig. E comprises at A the name of the island of Scandia, from which in bygone days the most powerful people have gone out into the whole world. B ~ The arms of the Kingdom of Sweden: three crowns. C ~ The arms of the Kingdom of Norway: a lion armed with a broad-axe. D ~ Here they try to measure the unfathomable depths of the sea. E ~ A monster looking like a rhinoceros devours a lobster which is 12 feet long. F ~ Plates are fastened as shields to the feet of the horses so that they will not sink down into the snow. G ~ Domesticated reindeers give excellent milk. H ~ Lynxes devour wild cats. I ~ An attack by wolves against elks on the ice. K ~ Pyramids and enormous stones bearing the deeds of ancestors described in Gothic letters. * is the sign for finds of iron. * Finds of copper. * Hoards of excellent silver. L ~ A lake which never freezes. M ~ A sea snake, 30 or 40 feet long. F Below small A: its often happens that the sea freezes and is able to carry very heavy carriages (sledges) and at the same time alongside their route leaves a navigable waterway to the seafarers, who compete with the carriages in swiftness. B ~ Wild donkeys or elks pull the carriages swiftly over the snow. C ~ A fight between shepherds and snakes. D ~ Pheasants or woodcocks lie hidden under the snow without food for several months at a stretch. E ~ Other birds, totally white snow birds, which never show themselves except during sever winters. F ~ A black river of immeasurable depth; it contains only black fishes, but these have a delicious taste. G ~ Outbreak of an unendurable din, when something living is thrown into the Viborgian cave or hollow. H ~ The den of beavers, partly on land, partly in the water; how they build it by drawing together pieces of wood. I ~ The pelican, a bird big as a goose giving out a very strong call with his water-filled throat. K ~ The otter is tamed to fish and to bring the fish to the cook. L ~ People are moving rapidly over the endless frozen sea with (skates made of) bones under their feet. M ~ Vessels for feasting, called Kåsa. N ~ During the winter fighting takes place on the ice as during summer it does at sea. G gives the whole key to the map as well as parts of the kingdoms of England, Scotland and Holland. H contains at letter A the old kingdom of Frisland, where there are excellent horses, and then the kingdom of Denmark, broken up into its many island and among its warlike inhabitants. B ~ The mighty and stately Vendic towns, the harbours of which are permanently lit up so that the seamen can avoid running into any danger through carelessness. C ~ Public lodgings are sometime built on the frozen sea. D ~ Collecting amber on the Prussian coast. E ~ The town of Danzig, inhabited by well-to-do and honest citizen. F ~ The benevolence of the fishes called rockas in Gothic and raya in Italian: They protect the swimming man and save him from being devoured By the sea monsters. G ~ The kingdom of Gothia, the first fatherland of the Goths. H ~ The island of Gotland, according to the etymology of its name, the island of the Goths, where even today cases involving maritime law are settled. I ~ Fires are lit on the coastal mountains in wartime. K ~ The royal city of Stockholm, well protected by the art of fortification, by natural formations and water. L ~ Mighty ships for sea battle, equipped on all sides with big canons, from which pieces of iron are fired, enclosed in barrels. I first contains at the letter A ~ the country of Livonia, which is under the rule of the German Order of the Blessed Virgin. B ~ Kurland, on the coast of which there are repeated shipwrecks and scant comfort is given to the victims. C ~ Samogethia, so called after the settlement there of the Goths. D ~ The Grand Duchy of Lithuania, under the King of Poland. E ~ shows an aurochs which easily lifts and tossen a man in full armour. F ~ Bears poking honey from the trees, are being beaten down by ironspiked clubs which have been hung there. ~ Finally a table gives the names of a number of peoples who according to the unanimous testimony of the ancient authors originate from the island of Scandia. Forbidden for a period of ten years (the map is entitled “The Geographia or Description of the Scandinavian Countries”). This prohibition also applies to his books describing the Scandinavian countries. Anyone infringing these rules is threatened with excommunication and fines of 200 golden ducats. ~ After the description, it is noted that the map can be bought in the shop of Thomas de Rubis at the Rialto bridge in Venice. A map of the countries of the north, remarkably modern for its time, was printed at Venice in 1539. The viewer here meets for the first time a map of this region which was correct in its main features. In size too the map was a work on a grand scale, nine sheets printed from wood blocks, were assembled to form a map 1,25 meters high and 1,70 meters broad. The creator of this remarkable map was Olaus Magnus (1490-1557). Certain stages in his life are unknown, but it is known that he was born at Linköping. Received an education in the church, and stayed at various seats of learning abroad. On his return to Sweden he was active in the church at Uppsala and Linköping. In 1522 he was a priest in Stockholm. Some years earlier Olaus Magnus had travelled in northern Sweden and Norway as a collector of church dues. The money was to be used in the building of St Peter’s in Rome, which began in 1506. The journey, which took a year from may 1518 to summer 1519, taught him much about the nature and the people of these tracts. He was to have great use of this knowledge in his later undertakings. In 1524 Olaus Magnus was sent to Rome by the newly elected king, Gustavus Vasa, for diplomatic negotiations with the papal curia. During his absence, however, the Lutheran teachings gained an increasingly strong footing in Sweden. He lived for about a decade in Danzig and it was there work on the Carta Marina started. But it was not until he moved to Italy at the end of the 1530’s that it became possible to print the map. Olaus Magnus added to the Carta Marina descriptions in latin (on the map), italian and german (printed separately). The map can be regarded as an anticipation of his major work “Historia de Gentibus Septemtrionalibus” (history of the northern peoples), printed at Rome in 1555. 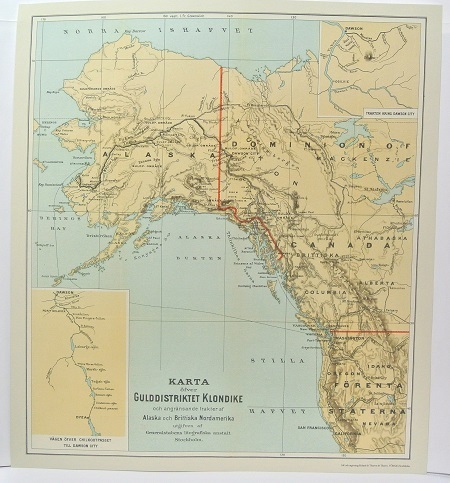 This is the first description on a large scale of the countries and peoples of the north. Its connection with the Carta Marina is obvious. It can be said that his “history” constitutes a richly detailed commentary on the map. Carta Marina was probably printed in a small edition, which explains its rarity. For centuries it disappeared without trace. In 1888 a copy was found at the Hof- and Staatsbibliothek in Munich. Seventy-five years was to pass before another copy was found, the one which Uppsala University Library secured from Switzerland. These two surviving copies of Olaus Magnus fantastic map of 1539 are priceless documents for the study of historical cartography and cultural history in the north.